The Robot Devil holding this violin (1ACV09). The gold violin is a violin that the Robot Devil owns. It is made of solid gold. Because of the Fairness in Hell Act of 2275, if anyone that goes to Robot Hell can best the Robot Devil in a fiddle contest, they can win this violin (1ACV09). If they lose, they win only a smaller silver one. He challenged Fry and Leela to a fiddle contest for Bender's soul. However, Leela just beat him over the head with it three times, causing him to squeal like a little girl every time and denting the violin with every hit. As the trio attempted to flee Robot Hell, two devils started closing the exit. Leela urged Bender to hurry. He responded by telling her to drop the "stupid gold violin", which was weighing them down. Leela did so, enabling them to escape, with the violin striking the Robot Devil in the head once again. 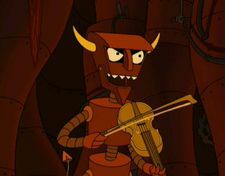 Robot Devil: The Fairness In Hell Act of 2275 requires me to inform you that if you can best me in a fiddle contest, you win back Bender's soul. As well as a solid gold fiddle. Fry: Wouldn't a solid gold fiddle weigh hundreds of pounds and sound crummy? Robot Devil: Well it's mostly for show. This page was last edited on 16 October 2014, at 14:27.